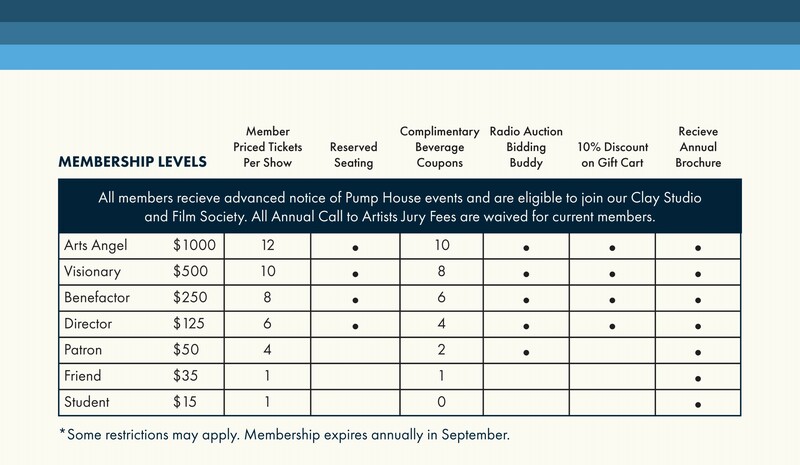 Become a Pump House Member! The Pump House has a long, venerable history of being a fun place for the arts. Since 1977, we have supplied the Coulee Region with memorable performances, inspired our community with art exhibitions, and educated our youth through unique opportunities. This is possible thanks to generous support from our members. We couldn’t do it without you. Pump House membership includes many benefits, which are outlined below. But, perhaps the biggest benefit of membership is knowing that you are contributing to a cause that, year after year, provides our community with inspirational art opportunities. Membership is the foundation upon which the Pump House rests! We encourage you to use the Pump House as your cultural ATM – your home for convenient and accessible Art, Theater, and Music!